And I know that it can be hard to pay attention or find the silver lining since the next day Trump replaced Jeff Sessions (good riddance) with the even more nakedly corrupt and cowardly Matt Whitaker — kicking off a constitutional crisis in an attempt to end the Mueller investigation and declare himself above the law. But it’s important – not just to those of us who worked on the election but to all of us who care about climate change – to pause for a second and remember that we fought like hell and actually WON an amazing thing. Like a lot of you, I was bummed to lose high-profile races like Beto and Ben Jealous (MD). And I think Andrew Gillum might have conceded too soon in FL – Stacy Abrams (GA) has the right idea fighting for every single ballot to be counted. But there’s no spinning some of the great house candidates who we fought hard for, and deserved to win. Candidates like Leslie Cockburn (VA-05), Dana Balter (NY-24) and Ammar Campa-Najjar’s (CA-50). But for every race we lost, there were more that we won 30+ House pickups, and seven (7!) Governorships! And it’s not just that Scot Walker lost (though good riddance), it’s that we elected strong WOMEN governors in states like Wisconsin, Michigan and Kansas. That, combined with the passage of Measure 4 in Florida, which returns the right to vote to 1.4 million returning citizens and non-partisan redistricting in Michigan is going to re-shape the election map.All over teh country we swept out corrupt, anti-voter politicians and installed progressive, pro-voting leaders. Given how badly gerrymandered the House map was after the 2010 election, Democrats needed to win the national popular vote by 5 % or more just to take the chamber. Instead we won by closer to 10% – an absolute thumpin’ for Republican values and ideas – even if some seats were too gerrymandered to win and Trump is too narcissistic to notice. But more important than where we won and lost, is how we fought this election and who we fought for. Because we didn’t just win, we made history by sending a diverse set of progressive champions to Congress. Champions like Deb Haaland and Sharice Davids, the first two indigenous women elected to Congress. Like Rashida Tlaib and Ilhan Omar, the first two muslim women ever elected to Congress; And like even Alexandria Ocasio-Cortez, one of the youngest people (and a woman of color to boot) ever elected to Congress. There was some initial worry among climate hawks that the Democratic gains in the House and at the state level wouldn’t mean much. After all, Republicans expanded their control of the Senate, and Trump will still be Trump. Faced with the epic challenge of trying to set a bold new path under divided government, Nancy Pelosi’s initial response was not inspiring. But things have really turned around in the week since: Those brave progressives I talked about earlier got to DC for orientation and immediately made a mark. 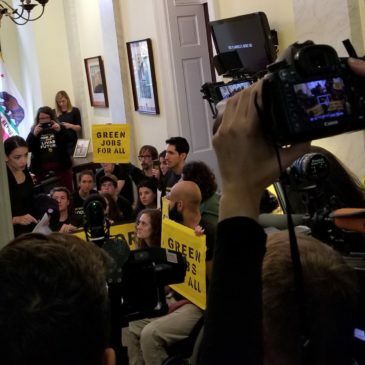 AOC jumped on a table to fire up youth climate activists, and then visited their sit in at Nancy Pelosi’s office the next day. That kind of outside-in pressure is just what we need to really change things in Congress, and this country. And, if we may be so bold, it’s right up our alley. For just over 2 years now, we’ve been using digital tools to help stage creative direct actions – usually with an elected or appointed politician as the target. We live streamed the occupation of the North Carolina Governor’s office, brought thousands of people into a conversation about pipelines and fracked gas infrastructure while locked to a giant bamboo tripod outside FERC (the Federal Energy Regulatory Commission), used twitter and facebook to expand the audience of the occupation of Governor Cuomo’s office (and sang “Hey yo Cuomo walk the talk” more times than I want to talk about) and lots and lots of other things too. What we DO here at 198 methods is use digital tools to expand the reach and power of direct action campaigns for the climate. Thanks to the incoming, diverse, progressive class in Congress, we might just have more chances to do that starting soon.